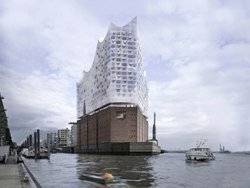 Hamburg, June 01 – During a Roofing ceremony that took place on 28 and 29 May, Hamburg presented with the “Elbphilharmonie” (Elbe Philharmonic Hall) its new concert house to the public. More than 5000 guests gained an insight into the making of this unique concert house. Designed by Swiss architects Herzog & de Meuron, the magnificent building is to become Hamburg’s newest landmark. Even now, during construction, the Elbphilharmonie is attracting worldwide attention. Under the artistic direction of Christoph Lieben-Seutter, it aims at becoming one of the world’s finest music venues. The building is part of one of Europe’s largest urban development projects, HafenCity Hamburg, and can be considered an icon of this booming port city. Moreover, it also portrays the public spirit of the Hamburg citizens: from among those €400 million construction costs, more than €77 million alone has been covered by donations and further revenues. After the Roofing ceremony, the work on this ambitious construction project will be further accelerated, so that the building will be accomplished by the year 2012.